The soup menudo is a traditional Mexican dish; a frequently spicy soup made with tripe. It is often thought of as a cure for a hangover since it tends to instigate sweating, causing the body to release toxins. Usually, lime, chopped onions, and chopped cilantro are added and some also add crushed oregano and extra crushed red chili peppers for a spicier taste. It is traditionally served on special occasions or with family. 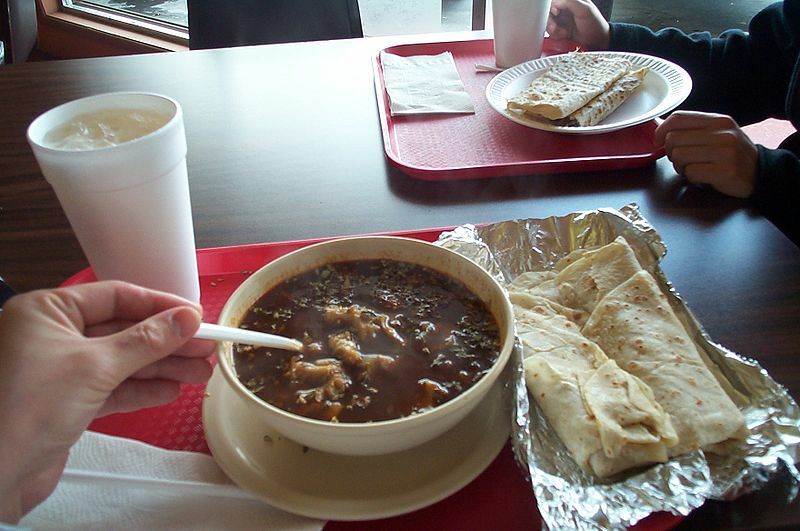 Menudo is usually eaten with tortillas. Menudo is time intensive, taking some seven hours to make. The meat should be rinsed clean first. Menudo usually has tripe, honeycomb and "librillo" stomach beef meat along with the beef feet and tendons. The feet and tendons are boiled first at low to medium heat for about three hours. Skimming off the top layer of floating foam about every 15 minutes for the first hour helps the flavor. After the first three hours, the stomach meat should be added along with salt, an onion cut in half, and one or two heads of garlic. A very important part of the menudo is the chili paste that is added at this time as well. The menudo is allowed to continue boiling for an additional three hours while covered to avoid evaporation. Once it is almost done, add the hominy. Menudo is said to taste even better after re-heating since the flavor will have concentrated more. The popularity of menudo in Mexico is such that Mexico is a major export market for stomach tripe from US and Canadian beef producers. Large frozen blocks of imported menudo meat can frequently be seen in Mexican meat markets.